Monique Jenkinson | Fauxnique | Upcoming events. 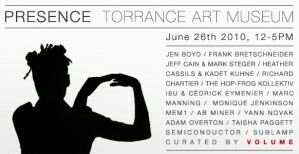 My video piece, A Glamour appears in ‘Presence,’ opening this Saturday at the Torrance Art Museum. VOLUME is pleased to present Presence, an afternoon of immersive sound, video, and durational performance work at the Torrance Art Museum on June 26, 12-5pm. Presence plays with the multiple meanings of the title to contextualize divergent practices by a unique selection of artists all working across a spectrum of time based media, whether it is video, sound, durational performance, or installation. Artists include Jen Boyd (audio performance), Frank Bretschneider (screening), Jeff Cain & Mark Steger (collaborative video performance/installation), Heather Cassils & Kadet Kuhne (sound and durational performance), Richard Chartier (sound element), i8u & Cédrick Eymenier (audio/visual performance), Monique Jenkinson (video screening), Marc Manning (audio/visual performance), Mem1 (audio/visual performance), A.B. Miner (film screening), Yann Novak (audio performance), Adam Overton (durational performance), Taisha Paggett (durational performance), Semiconductor (video screening), Sublamp (audio/visual performance).